We’re in the peak of Indian summers and this is the time the thirst goes up and the body needs something cooling to go with it. You normally don’t tend to have much appetite during summers but when you do, all that you think of is something refreshing, cool and light to eat and drink. It was evening and I had just finished preparing chicken curry for some guests dropping by for dinner and I became hungry. 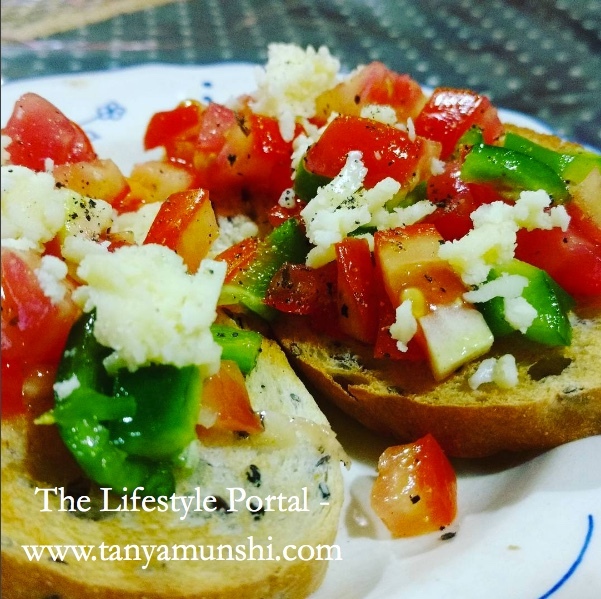 I was not in a mood to cook up something extra for me, so I quickly made this bruschetta with what was easily available in my kitchen. I liked it so much that I wanted to share it with you all. In a glass bowl add the chopped tomatoes and green bell pepper, grated garlic, olive oil and salt. Add the extra virgin olive oil and mix gently and keep aside. You can keep it in the fridge for around 10 mins to cool it. 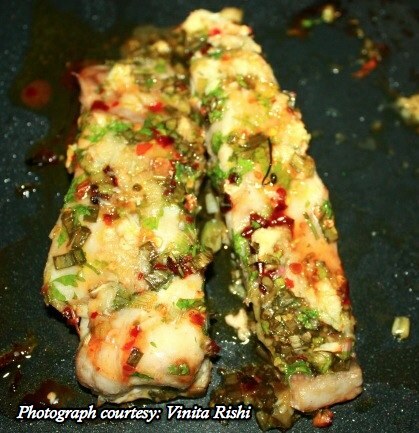 Lightly toast the Ciabatta bread slices and top each slice with the chopped veggies. Add some grated cheese on top and black pepper. Serve immediately along with some green tea on the side.